Email autoresponders are multi-step email campaigns that are used to deliver a sequence of emails over time. We use them to deliver educational resources for people that sign up on our website as well as highlighting product benefits during our free trial. 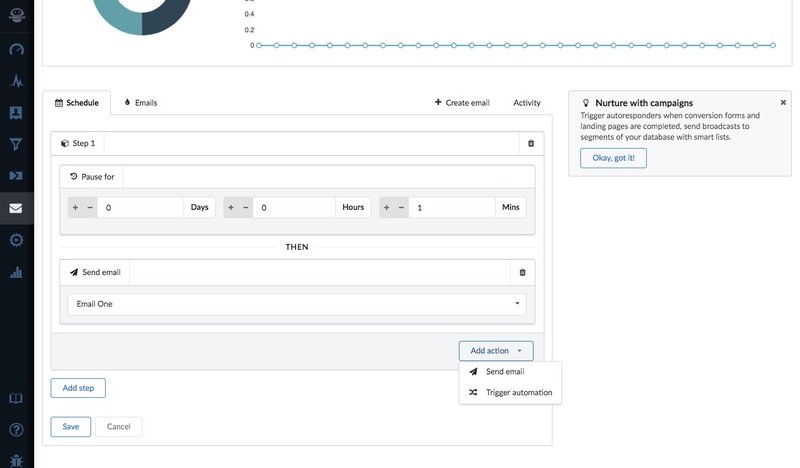 You can trigger an email autoresponder when someone converts on a conversion form, landing page or when a current contact triggers an activity stream (for example by viewing specific pages on your website). 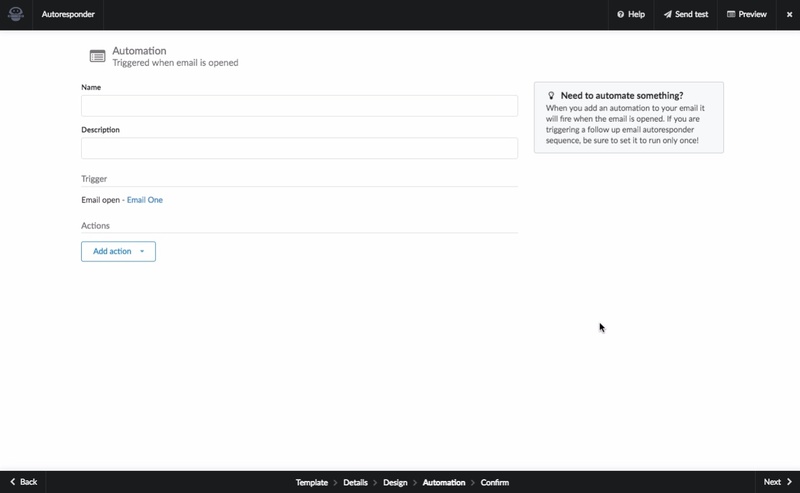 To trigger your autoresponder, simply add an automation to your preferred conversion form, landing page or stream and choose your email autoresponder campaign from the list. 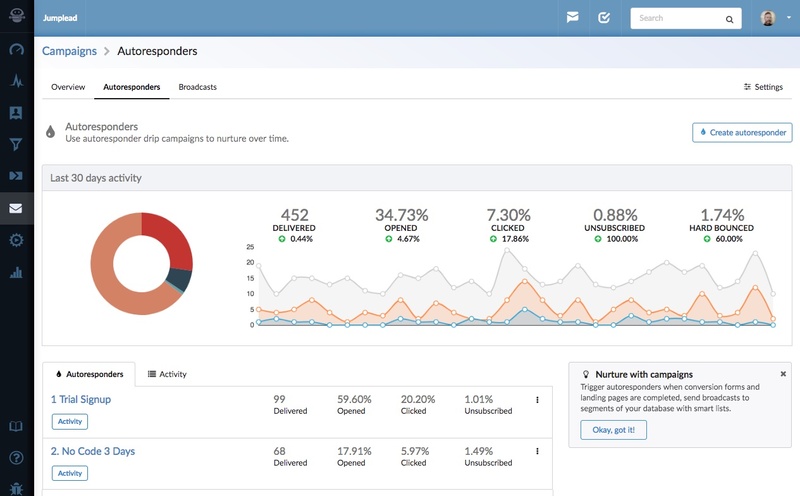 To get started click the 'Create autoresponder' button from the Autoresponders tab in the Campaigns section. 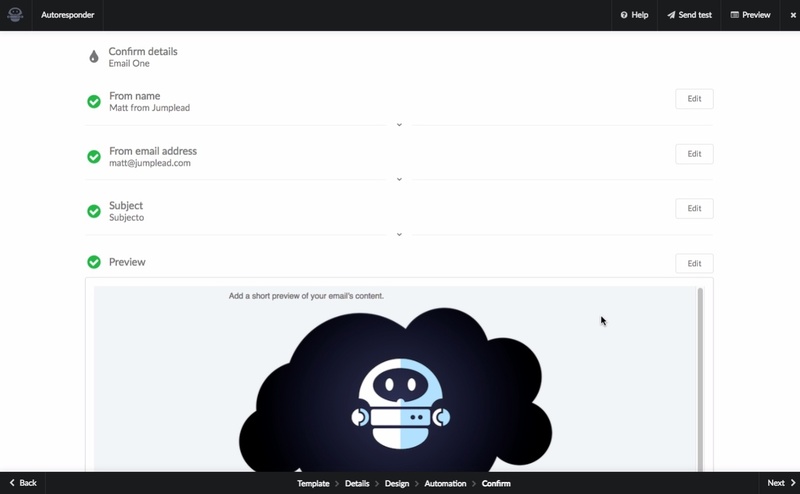 On the Details page give your autoresponder a name, and add your company name and details. Then confirm whether you would like your Contact to be able to receive this autoresponder sequence more than once. You can also limit the delivery of your autoresponder to contacts that have given you a specific privacy consent. Click 'Save' and you are taken to a multi step setup wizard to help you create your autoresponder. You can either select one of the responsive design Jumplead templates, start with a previously saved email design or code your own. Once you have selected your preferred template you will be taken to a screen to add a name for your email to identify it and pick a ‘From Address’ and a ‘Subject’ for your email. You can add a ‘From Address’ from the Settings page within the Campaigns section. Once you are happy click ‘Next’. 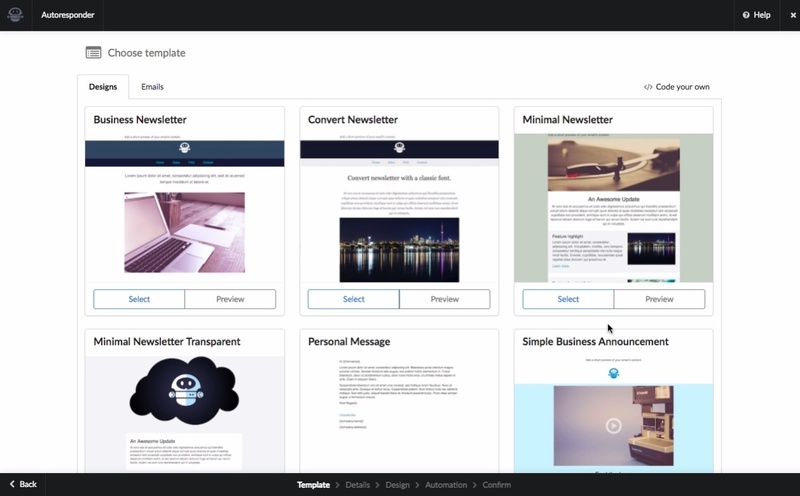 Once you’ve chosen your template you’ll be taken to the Email Builder, where you can refine your email with your own content. 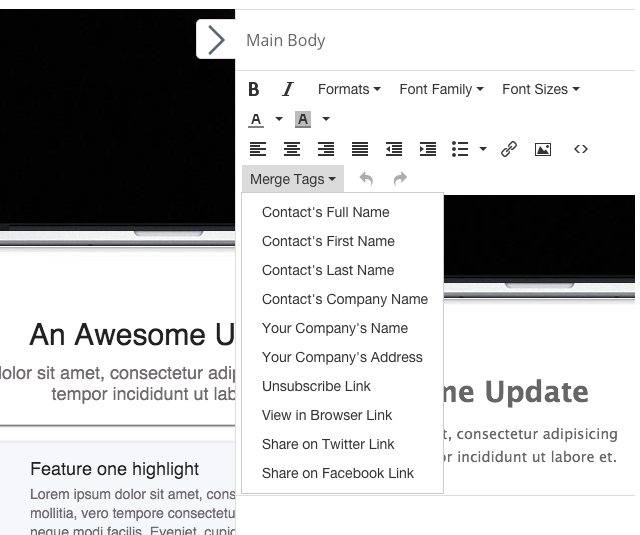 Use the Merge Tags to include dynamic content in your emails to personalise them. 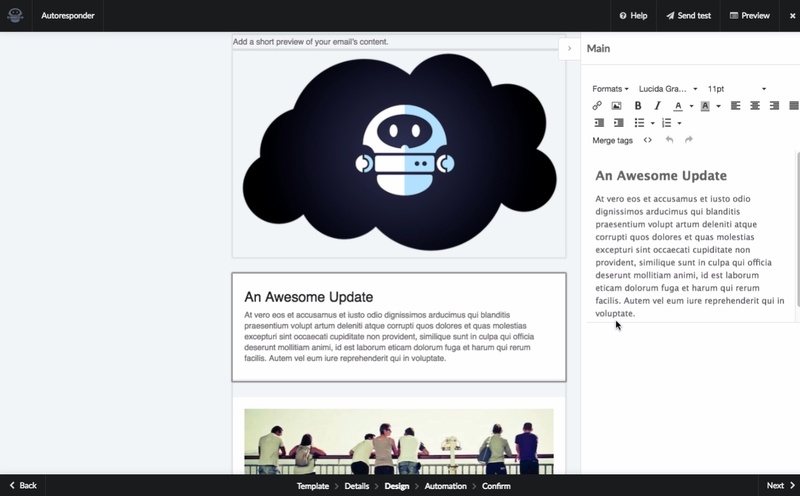 Clicking into the design areas of your email opens up an editor sidebar from which you can edit your email’s content. You can also send yourself a preview email to check your design in your inbox, previews are for design only and the ‘preview in browser’ and ‘unsubscribe’ links are disabled. Use the ‘Merge Tags’ to place dynamic data in your emails to personalise them, you’ll also need to include your company name, company address and tags (unsubscribe is a link URL) to ensure you’re complying with email sending best practice. You can also edit the HTML by clicking on ‘Tools > Source code’ from the HTML editor’s menu. Once you are happy with your email, click Next. 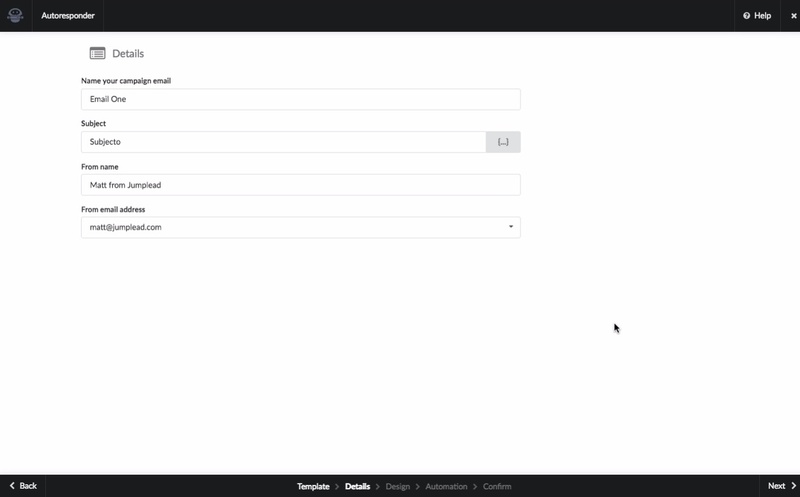 If you would like to trigger an automation when the email is opened you can add it from the automation page. Check and confirm the details and design of your email, click Next and Save. Your email is now available for you to use as part of your autoresponder campaign. 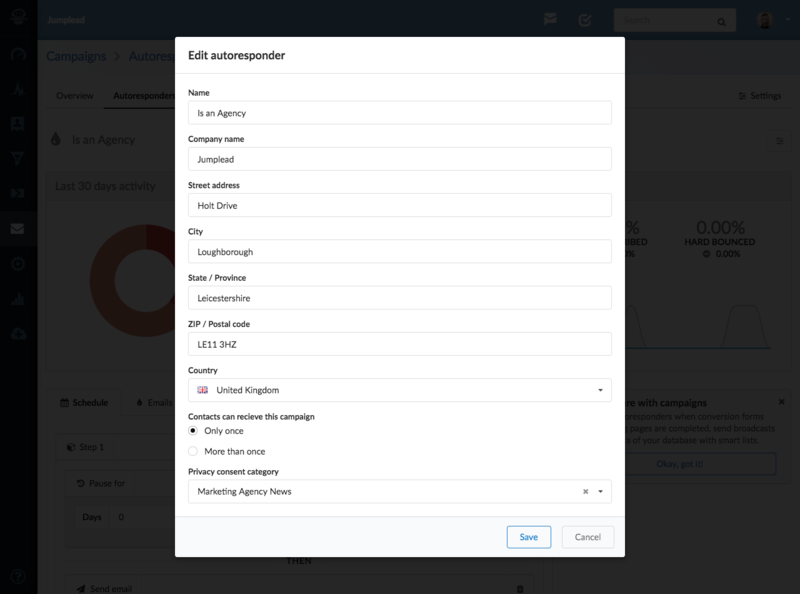 Your autoresponder has a schedule for you to add your emails to in sequence, an 'Emails' tab that lists the emails available in your campaign, a 'Create email' button for you to create extra emails and a button that links to your autoresponder's activity. 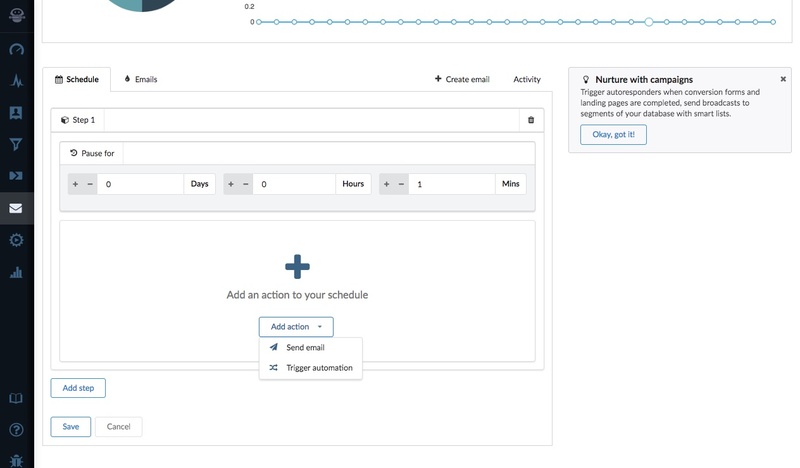 When you have added all of the emails you wish to use in your autoresponder, create a schedule for their delivery. Begin by adding your first step. A step has a pause and an action, so if your autoresponder is triggered by a form completion, you might send a 'Thank you' email straight away, then wait for a few days to send your second follow up email. You can also trigger an automation as a step, so when someone completes a certain sequence they trigger an automation to begin a second sequence. You can also trigger more than one action at each step. 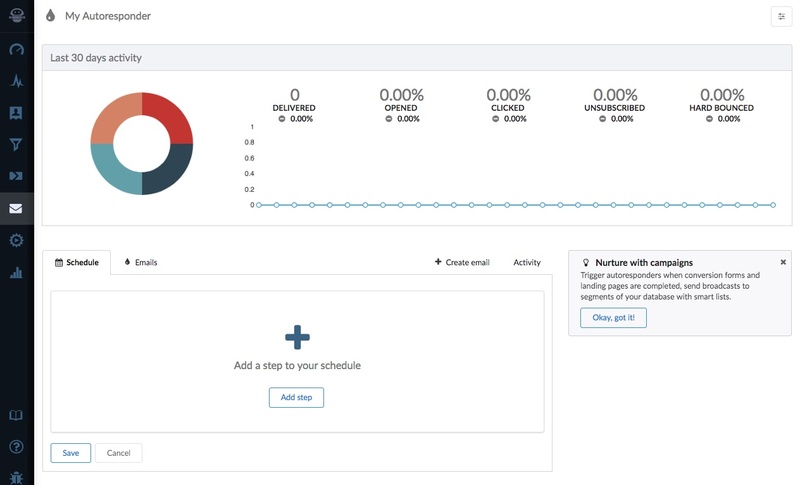 Add any further schedule steps and delays you’d like for your campaign, click ‘Save’ and you’re done. Contacts that are enrolled in the email autoresponder will receive each email in turn until the last email is sent. Then they will be marked as having completed the sequence. Adding more steps subsequently will not send new emails to previous recipients.